Women on a Mission: Mom Edition: SLAGS' BABY SHOWER: Pink Ombre Cake + Buttercream Frosting Recipe! This past weekend was Slags’ baby shower and it was fabulous! She is the cutest mom-to-be, and I have so much to tell…but I thought I’d start with the cake Slags and I made for the shower. It was GORGEOUS. Shout out to Thrifty Nana (my mom) for letting me watch her make all my cakes as a kid so I know how to do it now! The first thing I did was bake two 9” round chocolate cakes and two 6” yellow cakes. I used box cake mixes because those are foolproof. The cakes need to be baked a day or two ahead of time. Thrifty Nana helped me out by baking these on Thursday. Any batter leftover can be put into cupcake papers and baked on the side. No waste! 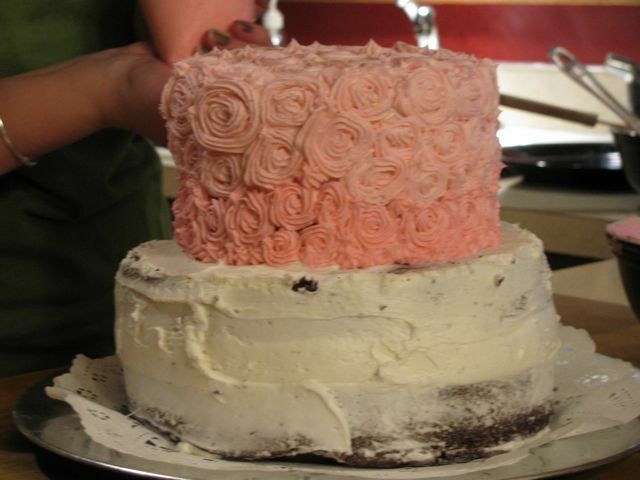 The day of the cake-assembly, I whipped up the buttercream frosting. You can find a recipe at Wilton online (lots of variations) but I use my own recipe. Here’s what you’ll need: 2 sticks of room-temperature unsalted butter (which = 1 cup); 1 cup of white Crisco vegetable shortening (you must use this because butter just cannot hold up on its own, it’s too soft); 1½ teaspoons vanilla extract; 2-4 cups of powdered sugar (I know, I always give a big range, but I’ll explain that in a minute); milk or cream (I used heavy whipping cream because that’s what I had on hand); and food coloring (if you want). To make the frosting, beat the butter and shortening and vanilla together in your mixer with the beater attachment, until mixed. 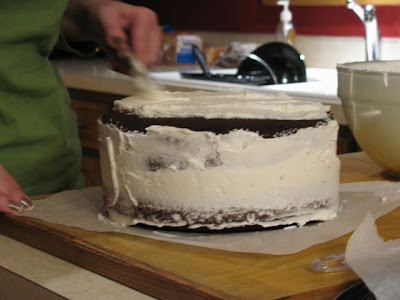 [Note, you can try making this frosting with a hand mixer and large mixing bowl, and I think it will work, but I cannot make a guarantee because I have never tried it. Sorry.] Sift the first cup of powdered sugar into your mixing bowl. It is important to sift the powdered sugar so you don’t get little pebbles of sugar in the frosting. Mix slowly at first so the sugar doesn’t puff up everywhere, then speed up until everything is mixed up well. Taste it. It will probably be too buttery and not very sweet; it will probably not be very stiff. You definitely need more sugar at this point. Add another cup of sifted powder sugar, same steps. Taste again. You are going for a combination of buttery-sweet and spreadably stiff frosting. 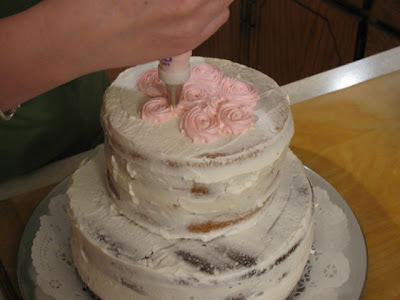 If it’s too soft, it won’t ‘pipe’ on with the cake decorating tips well, but if it’s too stiff, it won’t spread on the cake with the knife for the layers and crumb coat and could rip the cake. This is why I have you go a cup of sugar at a time. If you think you’ve gotten it right, don’t second-guess yourself, just go with it! If you do add all the sugar and it seems too stiff, add a dash of milk or cream; if you add all the sugar and it still seems too soft (could have to do with humidity), add more sifted sugar. Because I was making a layer cake for Slags’ shower, with multiple colors, I made two batches of frosting – it turns out one would’ve been enough, but it would’ve been worse to run out in the middle of decorating the cake!! So we know that Slags and Brian are having a baby girl, and naturally since PINK is my favorite color, Teresa gave me the go-ahead to run with my favorite color. I was doing an owl theme, so I did a few other colors, but the cake DEFINITELY was going to be pink. 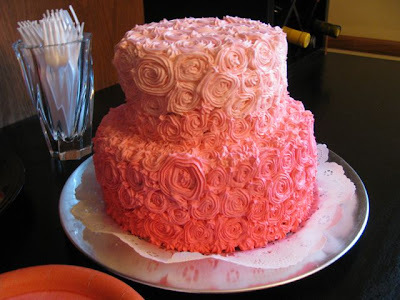 When I saw this ombre pink cake on Pinterest, I knew it was the one. DECISION DONE! Making a layer cake of this size is really easy. It doesn’t require inner supports because it isn’t all that tall or heavy. If you’re going to be traveling with it, though (we did it at the shower location), you may wish to put some food-grade wooden rods in the center for strength. 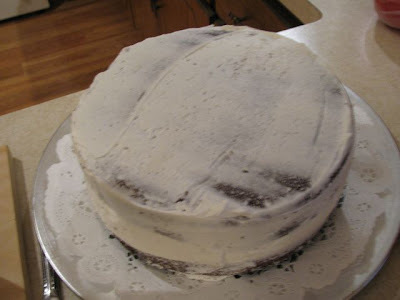 And because I was going to do all-over decoration with the cake-decorating tips, I didn’t need to do a perfect, super-smooth covering with frosting, just the crumb coat to keep the nasty cake crumbs out of the top layers of your cake frosting. So place the bottom layer of your 9” cake onto wax paper, on or near the surface of where you will be presenting the cake, like a platter or cake stand (I didn’t start on the cake plate, but I’m used to moving cakes, so I have practice). 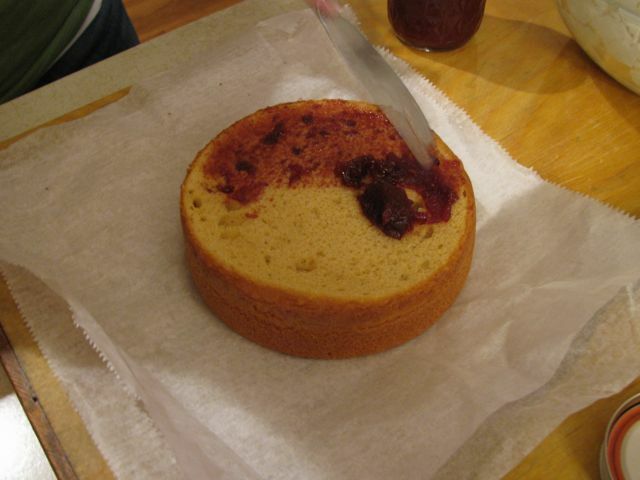 I put a layer of chokecherry jelly on the cake, then a thick layer of frosting, then the 2nd 9” round cake. Starting with the sides of the cake, apply a generous layer of frosting, smoothing it out to a relatively thin level once it is fully applied. Then apply a layer to the top, again, thinnish. This is the crumb coat. 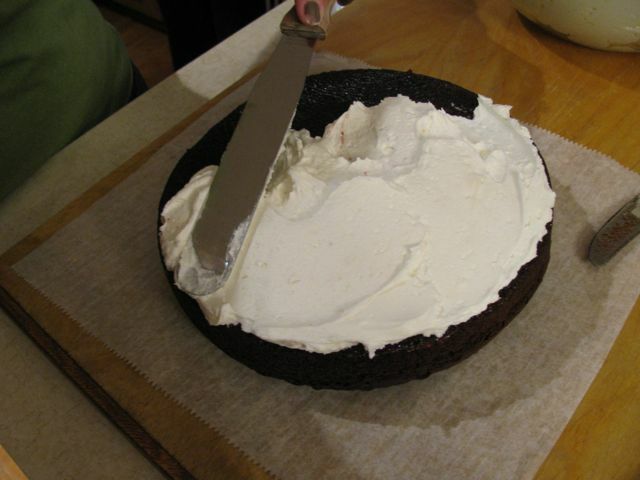 Now, gingerly slide the wax paper toward you and lift the cake onto the platter or cake stand. I placed mine onto a round piece of cake paper lace doily and then cut away the visible wax paper. Adding chokecherry jelly to the middle layer before frosting. This is the 6" layer. Do the same thing for the 6” cakes. You will place this cake, once assembled into its double-layer, directly onto the 9” cake, so you must remove the wax paper from beneath it before placing it on. It’s small enough that as long as you’re gentle, you shouldn’t have any problems handling it. 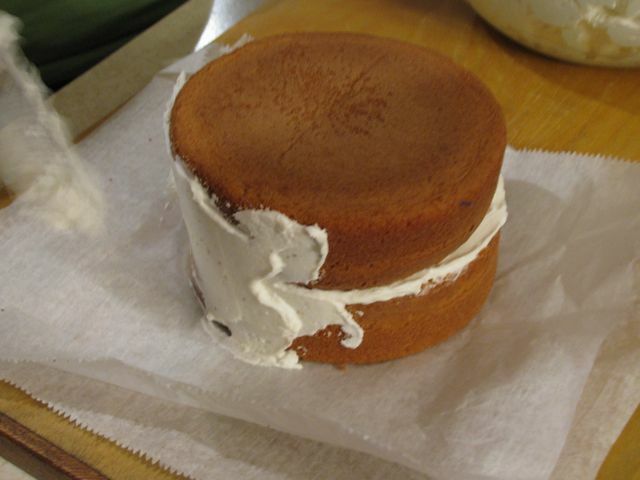 Side-application to the smaller cakes. I turned the tops (from baking) toward the center because I had to shave the roundness flat a little bit. The bottoms are nice a flat so I had those face out. 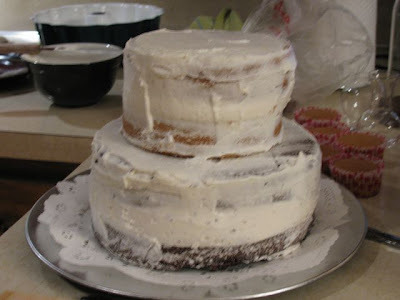 Now that the cakes are crumb-covered and positioned, you just have to frost them!! I wanted to do the graduated pink ‘ombre’ flowers. Using the largest star tip I had (I couldn’t find TN’s entire collection of tips, just a few of them) and pink gel food coloring, I started with a very light pink, and made a swirl. 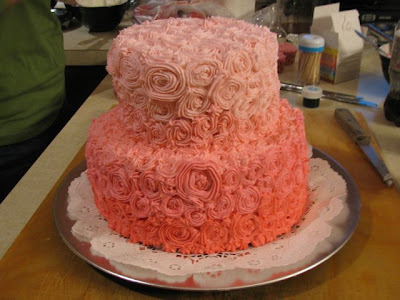 You can practice on a plate before you try on the cake if you want. 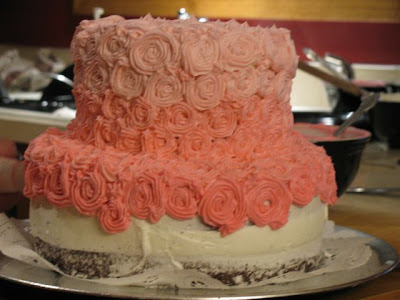 I did the light pink on top and graduated the darkness of the pink down to the bottom of the cake. We did four levels of color. I had to add some red by the last pink color level because we had maxed out the color intensity of the pink food coloring I had. Here's the coloring with flash - it's how it looked in person, but in natural light, you couldn't see the white spots of the crumb coat between the swirls that show up in this shot. We left the to cake sit out overnight. It’s good to let the outside of the frosting harden slightly (it’ll still be nice and creamy) so it won’t smudge as easily. There were about 20 guests at the shower and we didn’t even eat half of the cake. 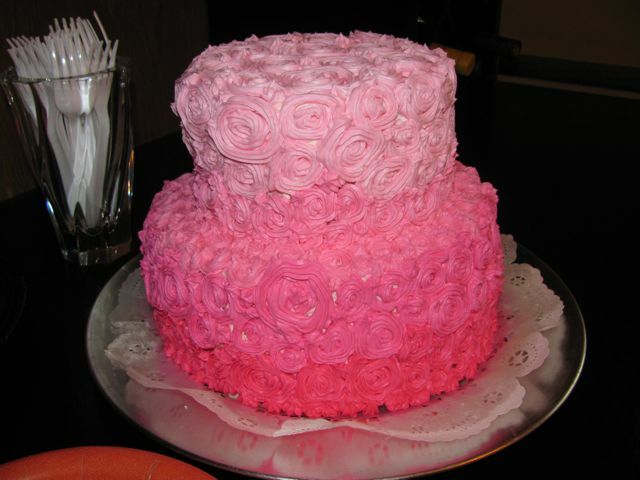 Don’t worry, you can feed a lot of people with a cake this size!! So, as I observed on the Pintester’s site the other day, while most of Pinterest appears to be pins geared to make us feel worthless at painting our nails, baking, cooking, throwing parties, getting married, affording clothes and decorating our homes, there are a few things here or there that we can do! And look, I’ve picked an ombre that actually can be done -- and doesn’t just look like your hair-color grow-out is too long and your roots just really need to be touched up!! Oh yes- I love pink ombre. I had my mom come work on my daughter's cake last Aug. It came out great. That pink frosting sure deepens as the time goes by though doesn't it?? Our darkest part was deep magenta by the time we served the cake. SNEAK PEEK: LORI'S XMAS CARD! Please Help a Stranger and Hug Your Kids. Ethne's House is Decked for Christmas! WE ARE ROCKIN' CAUSE MUR-MAN IS 3!